This is a request that the OSI Board consider the idea of a small OSI working group for a likely 2-year period, to advance the free/libre/open concepts and understanding amongst the stakeholders of the presently-emerging global digital payment systems (technical; business; legal; governance). Note: This proposal is not to represent OSI. It is to structure and maintain a channel for the OSI Board and membership to be engaged in this W3C project. All submissions would be cleared first with the proposed WG, then by the OSI Board. For overall context please the message included below from Stephane Boyera, co-manager of the web payments initiative on W3C staff. Below is a detailed background. If the suggestion seems suitable for formal consideration, it will be restructure into a WG proposal. The intent of this current message is to request some initial informal reaction and feedback from the Board. Linkage to OSI's Mandate: Increasing Awareness, Participation and Contributions to the OSI. People of a free and democratic society can rightly demand openness, transparency and accountability for the computer programs used in monetary system operations, analysis and reporting. This is expressed in the International Monetary Fund's Code of Good Practices on Transparency in Monetary and Financial Policies (IMF 2000), specifically that "the coverage of transparency practices for financial policies in the Code includes those for the operation of systemically important components of the nation's payment system". It is a democratic principle of monetary systems design that the computer programs implementing them, engage free/libre/open methods and licensing. In my current interventions through participation in the current high-profile developments relating to web payments standardization, I've been making the case that permissively licensed free/libre/open source software reference implementations of the functional components of UNCITRAL model laws, conformant with W3C and IETF specifications, would serve the public interest in open markets, and reduce the cost and time required for tangible implementation and compliance. At the same time it would also improve inter-jurisdictional inter-operability, systems auditability and security. In the past several months I have been serving an informal pro bono liaison role between the W3C and the UNCITRAL Working Group IV on Electronic Commerce . On that front, the Chair of the UNCITRAL WG-IV recently suggested I explore whether W3C or OSI might request Official Observer Status at their meetings each 6 months, alternating between NYC and Vienna—again on a case-by-case approval basis. 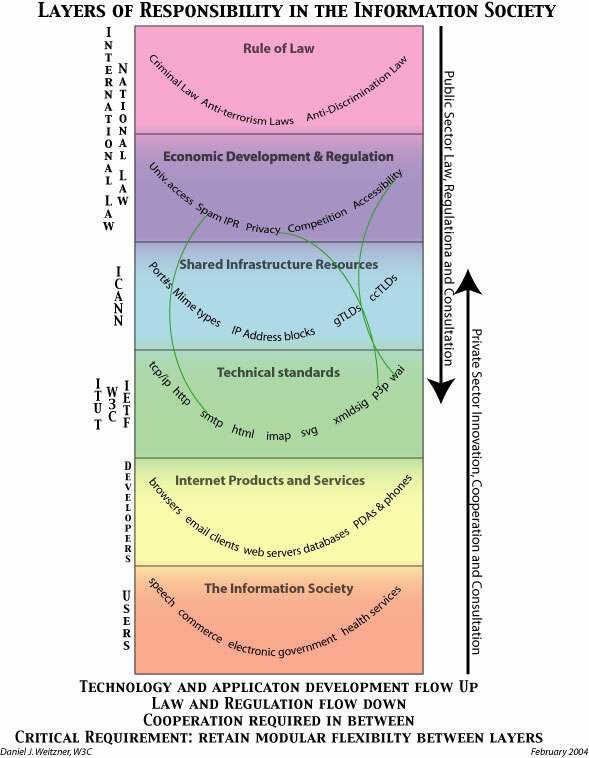 It seems to me to that an OSI Observer role with UNCITRAL WG-IV can be more far-reaching than having W3C in that role, because free/libre/open principles are relevant throughout the entire IT stack through which payments systems operate, compared with the W3C mandate comprising only the web layer in the governance stack (http://www.w3.org/2005/05/image001.jpg ) This, OSI is well positioned to assist dirverse organizations in this realm, which is a very good way to increase awareness, participation and contributions to the OSI. For this reason it seems to me that a WG on this topic could assist the Board, in alignment and synergy with OSI's new re-branding effort. I think it would be possible to run a successful supplier-neutral OSI fund-raising campaign (both corporate and individual) directed towards this topic. Several of the most significant new entrants to the payments domain are licensed and coordinated free/libre/open source (eg the Ripple clearing house system, and various block-chain systems involving Bitcoin and its derivative systems). As you know, parallel to my collaboration in recent months with OSI to establish and develop the FLOW Syllabus, I am also an active participant in the W3C's work towards an open specification on web payments. It is one of the venues where I have been committing my efforts to advance and sustain free/libre/open source principles in core monetary and payments systems. In his message below, W3C's Stephane Boyera explains that membership in the new Web Payments Steering Group generally requires that the individual be an employee or contractor to a W3C member organization. But there is also provision for invited experts. "To be able to participate in a Working Group as an Invited Expert, an individual MUST do all of the following: (a) identify the organization, if any, the individual represents as a participant in this group; ... (e) provide a statement of who will provide the necessary financial support for the individual's participation (e.g., for travel, telephone calls, and conferences), and (f) if the individual's employer (including a self-employed individual) or the organization the individual represents is not a W3C Member, indicate whether that organization intends to join W3C. If the organization does not intend to join W3C, indicate reasons the individual is aware of for this choice. Through The Opman Company my professional time would be covered for participation, but with reference to W3C's list in the previous paragraph, I would like to propose: (a) that I serve a communication liaison role for the OSI in this W3C process; (e) that the OSI agree in principle to cover my basic travel expenses to two face-to-face meetings per year, on a case-by-case advance approval basis; and if this would be approved, then as per (f) that you provide me a line or two to summarize why OSI is not a member of the W3C. Further into the depths of this topic, my doctoral dissertation underway at U Québec ("Free/Libre/Open World Market Payment Arrangements and their Emergent Effects") includes the design and implementation of payment methods in the venue of extensions to an advanced free/libre/open source macro-economic model . This includes the design and implementation of several major monetary benchmarks running free/libre/open algorithms , all based on free/libre/open data. Keynes. Attached to this email. See pgs 37-38. I would like to give you a complete update on W3C Web Payments activity. The last months since the workshop have been intensive and I want to thank again all those who participated in the discussions and contributed to the development of the W3C Web Payments Steering Group charter (aka Web Payments IG). The commitments for participants in the group are light: the group works by email, usually meets once a week for one hour teleconference, and then is likely to meet face-to-face perhaps three times a year. While not mandatory, participation in these face-to-face meetings, particularly in the first one, is important. In most cases, we will be able to organize remote participation solutions through teleconferencing. If you are the official W3C representative, then you just have to wait and receive son a call for review. You will have then to send your review and that's it. If you are not the official W3C representative of your company, you should get in touch with your representative (don't hesitate to ask me his/her details) and coordinate the review together. Participation in the group requires W3C membership. If you are interested to learn more on the benefit and process for becoming a member, please get in touch with me. In some exceptional cases, we may appoint individuals as invited experts (seehttp://www.w3.org/2004/08/invexp). I'm managing these requests on a case-by-case. Please let me know if the process and next steps are clear or if you have any questions. Feel free to comment publicly or contact me privately. Finally, feel free to share this email with anybody that may be interested in this work.